The all new Silver Cat Elite is made of E-glass composite material, which provides extreme strength and durability while catching huge cats. Designed for suspended drifting and anchoring, this rod has a non-parabolic action that provides stiff backbone, but with a faster tip to see "hits" more clearly. The action of this rod is unique and will provide excellent visibility. 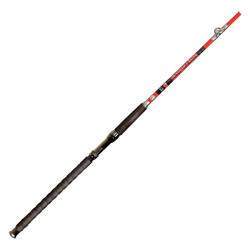 Other prominent features of this rod are a double-nut locking reel seat made of aircraft grade aluminum, hi-vis tip - especially useful for night fishing, and a high quality X-Grip provides extra grip and improves rod aesthetics.